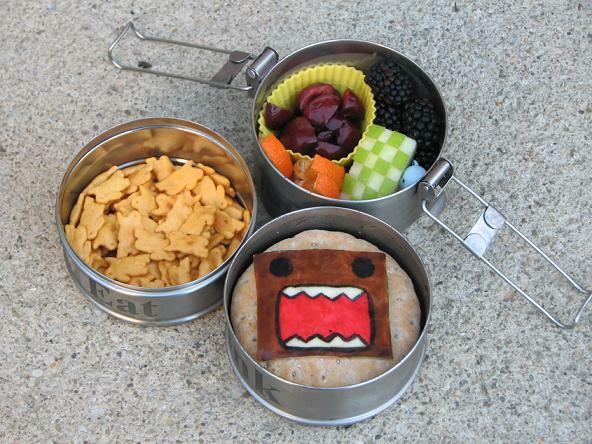 Bento for Kidlet: Domo invades lunchtime! Kidlet really loved his matching bento yesterday and requested I do all of his new shirts. There are a few that I'm not sure if I can replicate but I told him I would try my best. Today's is easy! This is Kidlet's new Domo shirt from Think Geek. If you ever need anything nerdy, that's the site to go to! We love it! Packed in the tiffin Kidlet has domo face made of cheese and food colors on a Boca chick'n patty sandwich. On the side are cherries, blackberries, checkered apple, oranges, and cheddar bunnies. And Kidlet's shirt with lunch! Think Geek is great and deserves a shout out :) Your bento is really great too! 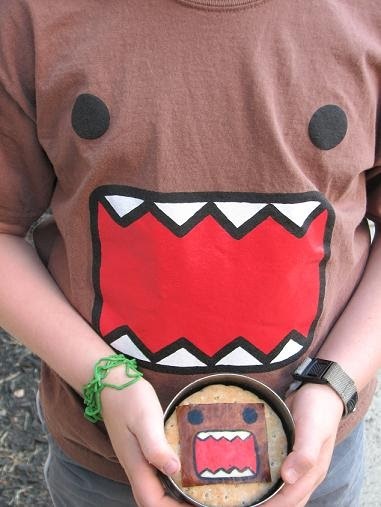 Domo bento looked exactly like the T-shirt! Amazing! Aw, the coordination is perfect...Domo lunch has lots of zing, and the berries look so good next to perfect checkerboard apple :D!